Perhaps Steve would run into less trouble if he planned to build a McDonald’s House for kids. Frank Sanchis should get his nose out Steve’s business. Show me what he’s done to help the neighborhood. Any have pictures of this house? dyng to see it. LET STEVE BUILD THE GONE DAMN HOUSE!!! then we’ll compare jobs’s work of art to the 2-bit nerd factory that gates lives in. oh i’m sorry. i was looking for the mac news section. i’m in the wrong place. It’s rather humorous to see liberals fighting amongst themselves like this. 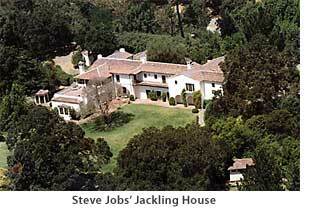 But seeing as how Steve Jobs is now a very rich liberal, many of them see him as the enemy now. Hmm, looks a fairly indifferent neo-Spanish to me. What’s missing in the argument is what’s proposed to replace it. Wherever do you get the impression that preservationists are liberals?